“There’s a couple of repairers in Melbourne” Territz said to me as we walked around the corner of Lygon street and down Elgin street. “There’s a guy that lives a lot closer to me that I’ve had look at a typewriter. But Tom’s different. Tom just seems to have that edge. His work just seems to be just that bit better than the other guy’s”. There’s not a lot of repairers out there that still have an operating shop. And none that is as close to a cultural hub as Tom’s is. less than 200 meters away from Tom’s shop is La Mama Courthouse theatre. La Mama started out a little further around the corner at a different location, and was a theatrical workhouse where writers – many of them quite famous, could workshop their plays and other literary works. I’d worked on many performances in the Courthouse theatre myself, and I still have a love for the place. Add to that the nearby university of Melbourne, as well being in walking distance to the vibrant Lygon, Brunswick and Smith streets and you have a typewriter shop in the middle of where pretty much it is all happening in Melbourne. And I know for a fact that a lot of the writers that circulate around there use typewriters. As we approached Tom’s shop I was greeted by a familiar sight. A black Corona 4 in the earlier curved and peaked front shape, was pressed against the glass. Tucked in behind it was a very square Continental portable which was flanked by two giant printer/photocopiers that had several other typewriters piled up on them. 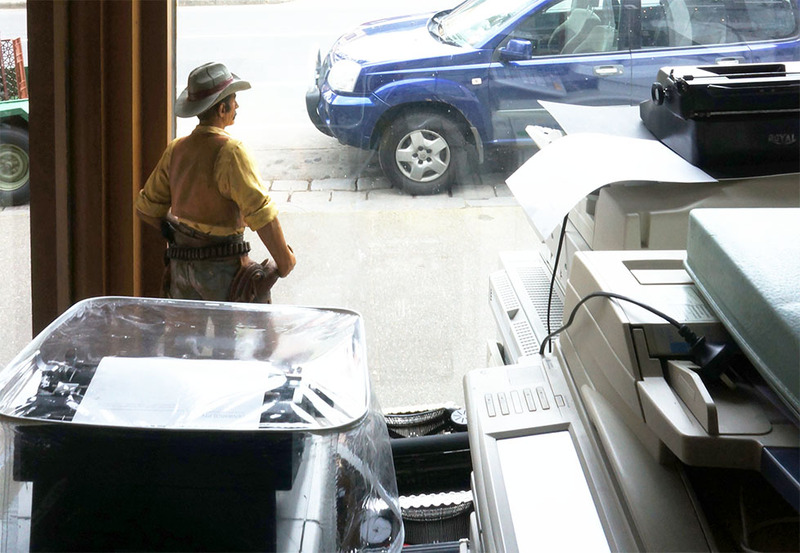 Standing guard in front of all of this was a cowboy that restlessly kept his eye on the street in front of the shop. Teeritz slid the door open, and we were immediately greeted by the strong smell of spray paint and oil. The source of this smell was to be found directly inside of the door; a black Remington 10 that I would later learn Tom had been brought back to life from a very dismal state. We called out, and soon Tom came out from somewhere at the back of the shop. His eyes lit up as he recognised Teeritz, and he gave me a welcoming handshake. 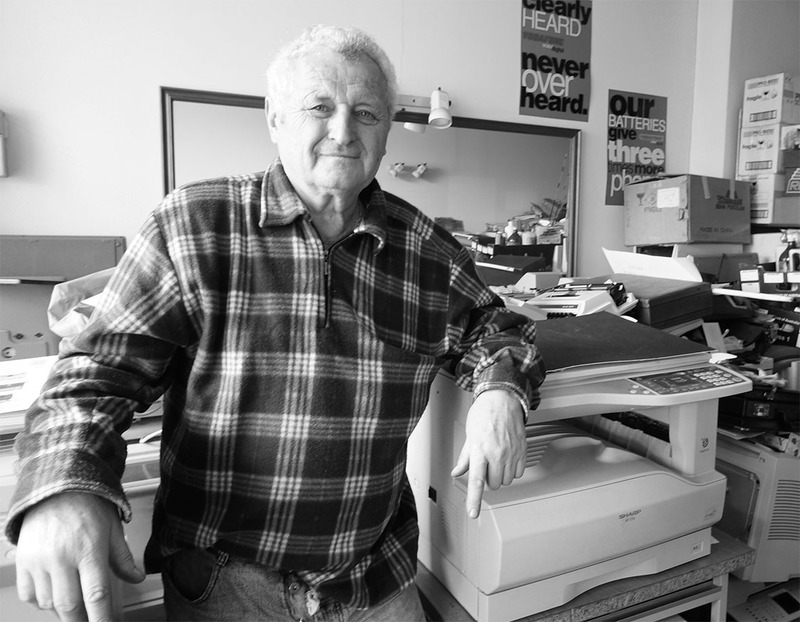 It was a struggle to get around his shop, as it has years of built-up clutter from Tom’s trade in repairing typewriters and other more modern office machines. I’m a fan of clutter myself – it always represents an opportunity of exploration, and Tom’s held a whole world of promise. While office copiers and printers dominated the floorspace in the shop, there were typewriters hidden almost everywhere you turned. An old Brother 760TR sat casually placed on top of a pile of other parts, and the familiar shape of IBM selectric machines jutted out of various locations. I kept looking around in the hope of finding a rare gem hiding amongst the clutter, completely un-aware that I had already seen one and foolishly overlooked it as being just another run-of-the-mill machine. Tom was very friendly to talk to. He’d been kept busy with Melbourne’s repairs for decades, and now many young writers were discovering his service. He had a folder of blogs and articles that had been written about him recently, and he handed copies to both myself and Teeritz to have a browse through. He pulled out one written by Rob Messenger, and then told both of us about the time he met Rob while doing some typewriter repair work at the ‘I am typewriter’ festival that was held in Melbourne some time back. “Do you ever email back to these people”? I asked. “Nope. I’m computer illiterate. I don’t do email”. It was in Yugoslavia and Germany that Tom had learned much of his trade and he seemed particularly fond of a lot of the German made machines. “Typewriters like this” Tom said as he waved his hand towards the Continental, “They were always the best and never gave people much grief. Olympias, Adlers, Continentals. They were all very good”. I suggested that he might find one of my typewriters interesting, so I pulled out my Gossen Tippa for him to have a look at. It didn’t seem to be a familiar model to him, but he nodded his head as he looked over it. With his bottom lip turned up in appreciation, he simply said ‘That’s a good one’. Tom was particularly proud of what he had achieved with a Remington 10 that a customer had brought in. “It was his fathers and had been sitting in the bottom of his shed for decades. It was full of mould and rust, and I wasn’t even sure I could fix it. But now look at it”! “I wish I had a before shot” Tom continued. “The customer will be wrapped with this”. He excitedly tapped at the Remington’s keyboard, showing how well the machine worked. And worked well it did! I’d love to have the machine myself. Tom was telling Teeritz and myself about some of the other typewriters he has in storage, which he may sell down the track. So I asked him the obvious question: did he have a collection of his own? “Nah” he said before he explained, “I fix typewriters. They’re just work to me”. I didn’t realise it at the time, but it wasn’t going to be the last time I heard that sentiment that week. The shop is actually part of Tom’s home. He lives upstairs and owns both the upstairs apartment and the shop itself. As such the shop is a very low-cost operation. Tom leaves the lights off in the shop most of the day, and he doesn’t run credit card or electronic transaction facilities. As he often is just a set of stairs away, he can keep very relaxed hours. That said, this is one of the few repair shops I know of that still have a fully working shop-front, and Tom is a pleasure to talk to. He showed me some of the other machines he had strewn around the shop – a Royal QLD, a Triumph Adler electric, A cyrillic Hermes baby, and….. that very interesting little surprise that I was talking about. But I’ll write about that typewriter soon. Suffice to say, something came home with me on this Melbourne trip. You can see it just peeking out in one of the photos above. I was glad I took the time out to visit Tom’s shop, and to be honest I really did need Teeritz to show me where it was. It is the kind of place you’ll miss if you blink – and is very modestly advertised. But if you need a repair in Melbourne, Tom’s shop strikes me as a good first port of call. 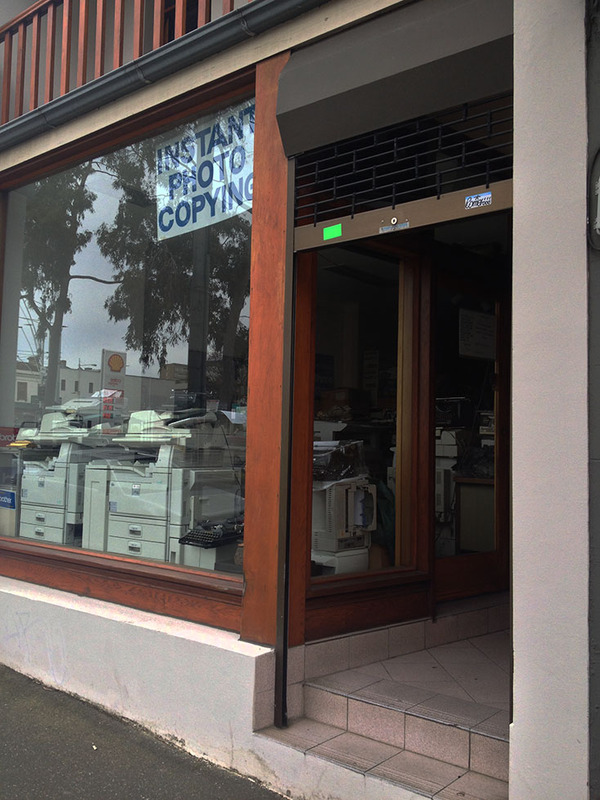 September 7, 2013 in Carlton., Continental, Corona 4, Cyrillic, Elgin street, Hermes, melbourne, Tom's, typewriter, typewriter repair. Looks like a wonderful place. I look forward to seeing what you bought. Looks like a great place to visit. I too, want to see what followed you home. It's a typewriter shop in disguise! Luckily you had a good guide to take you there. Three is definitely a crowd in Tom's shop, Scott. I'm glad you had a look at the place and that you got to meet Tom as well. Can't wait to see what he's got under that staircase! It was worth the visit. And I'll be posting on it very, very soon. I think it is always worth visiting the remaining repair shops. If anything, so you can get an idea of who they are before your suggest to someone to use their services. Really! I never knew. Were you there as a student? How do you feel I've done describing the area? And where have you been! Missed your blogging! Ha ha ha. Not that much in disguise. There's plenty of typewriters in the front window. Tom just doesn't advertising his services. Yeah, it was good. I'm very curious myself. If machines like that Corona 4 are around his shop, I reckon he has some good stuff. It is great that places like Tom's are still running. Thanks for the tour! did you take home that corona 4? 😉 I should take some photos of the only typewriter repair shop in Singapore. the shop has diversified into selling cashiers machine now. the repairer is an 82 year old man employee and the equally elderly owner said we cannot stressed the repairer too much! repairing will be done at his own pace and he'll call us to collect when the typers are ready. Please do! I have heard much about him, and I am very interested. Anythime. I find these very remaining shops very interesting. What a great story. Thanks for sharing your experience. It's almost like I traveled across the world and got to make the visit myself! Well, I feel it deserved a bit of considered writing. Thanks for your compliment! How much does he roughly charge to fix a vintage typewriter. 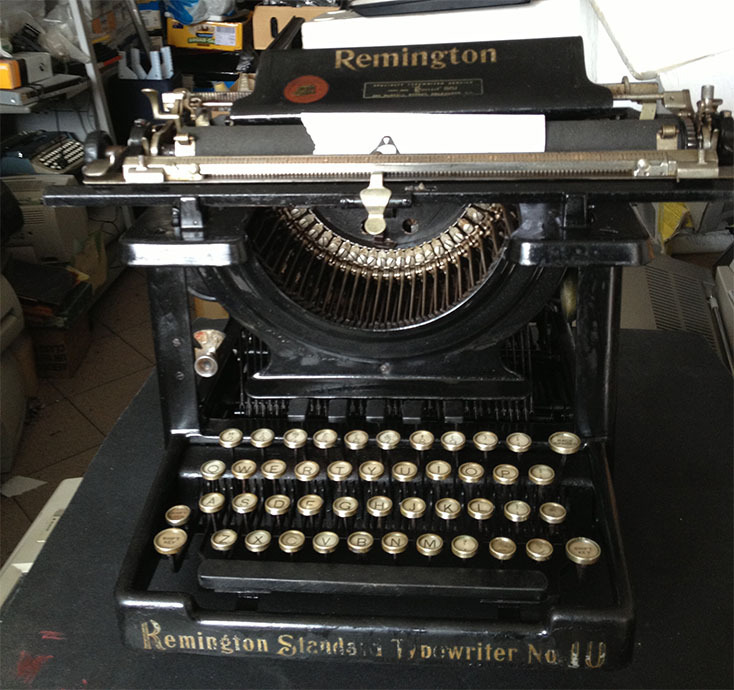 I have about half a dozen old typewriters – most of them have some problems.